Like the Beaux Arts style, Neoclassical Revival was inspired by the mammoth White City of the 1893 World's Columbian Exposition in Chicago. Neoclassical Revival designs, although less ornate than Beaux Arts buildings, are still noted for their extravagant and eclectic use of historical details. The Neoclassical Revival emulated Greek and Roman architecture, looking back also at the Federal or Jeffersonian periods, but added extra classical details for both large public buildings and small temple-like dwellings. This conservative style represented stability and strength and was frequently used for banks, libraries, museums, government buildings, and institutes of learning. The style was very popular between 1890 and 1920. 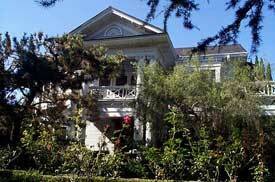 The style was first used on houses for the wealthy but trickled down to middle class homes in the twentieth century. The architect most associated with the Neoclassical Revival is Stanford White of McKim, Mead & White, who also specialized in Beaux Arts structures. Many architects, notably Louis Sullivan and Frank Lloyd Wright, found the style too predictable and confining and developed counter architectural styles that were freer in form. 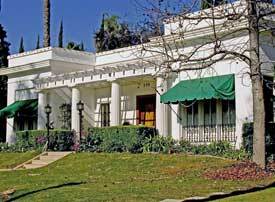 Unlike the popular Colonial Revival style in Fullerton, the Neoclassical Revival style was rarely used for either public or private buildings. The finest example of this style in Fullerton is the Pierotti House (1909), listed on the National Register of Historic Places, at 1731 N. Bradford Avenue. An excellent example of a one-story residence with neoclassical elements is the Kelley House (1923) at 539 W. Fern Drive. Bock, Gordon. "The Neoclassical Style." Old House Journal February 2002: 68-73.